After releasing Superstition in 1991, the Banshees headlined the first Lollapalooza festival and were then asked to record a song for Tim Burton's Batman Returns. The outcome was the fantastic stand-alone single "Face To Face" that was co-orchestrated by Danny Elfman. A year after that, in 1993, the group started to record material for a new album. They then took a break from the recording process to play several festivals abroad, performing some of their newer songs as well even though they remained unreleased. The following year, Siouxsie also duetted with Morrissey on an incredible, heart-rending cover or Timi Yuro's "Interlude". The band felt that the album wasn't quite ready yet so they collaborated with The Velvet Underground pioneer John Cale to finish it. Two songs were dropped from the initial version of the album and ended up as B-sides for a later single release ("Black Sun", "Hang Me High") while a bunch of new songs were recorded with Cale. The completed album The Rapture finally saw the light of day in early 1995. Superstition had taken the Banshees to a poppier direction than ever before, and The Rapture picks up where its predecessor left off. Siouxsie was not impressed with previous producer Stephen Hague's computer-based working style, so the new album was written with a different kind of an approach, with the band completely in charge (apart from the Cale-produced parts of it, of course). The lead single "O Baby" has got to be one of the most scorned SATB singles there ever was if internet forums are to be believed, and sure, on a certain level I can see the point: it's certainly no "Spellbound" or "Cities In Dust". With a legacy as long as theirs (nearly 20 years, 10 previous studio albums) the constant comparisons are inevitable. But as in Superstition's case, prejudices can make you blind and if you take of the nostalgia glasses, you can notice that "O Baby" is actually an adorable carefree '90s alt-pop gem where Siouxsie sings about being happy and presumably, in love: "The cracks in the ground grin up at me / Even the creases in my shoes smile up at me". The music video is an ironic jab at child beauty pageants, where Siouxsie first plays along, then tears her clothes to tatters, smears the dressing room mirror with makeup, throws tiaras around and stabs a wig holder. Oh, and turns a false eyelashes into a Hitler moustache. All this while sporting a pink princess dress. Hilarious. The darker numbers are usually among the definite highlights of the Banshees' albums and "Not Forgotten" is no exception: not only is it triumphant on its own, it also showcases Budgie at his best - his tribal, distinctive drumming truly makes him one of the most unique and talented percussionists in pop/rock music. And then in the next song, "Sick Child", he moonlights as a lyricist. It is a remarkably soothing song with beautiful, cello-accompanied instrumentals and represents the band's softer and more tender side. Both songs were used in movies during the time of their release: "Sick Child" in the American supernatural horror-fantasy film The Craft and "Not Forgotten" in the cult classic Showgirls for which the band also recorded another song, "New Skin". Easily the best tune they recorded with Cale is "Forever", a glorious swan song of the band with Siouxsie lamenting "We couldn't stay together / This couldn't last forever". Not all songs from the Cale sessions excel quite as well, though. "The Lonely One" would've made a good suitable B-side for "O Baby", but on The Rapture ends up feeling pointless and fillerish. (Funnily enough, with its accordion and summery soundscape, it sounds like it could be taken from The Creatures Boomerang LP.) Unfortunately, the same applies to "Falling Down" even though it does sound edgier and has more going on. The biggest issue I've got with this LP is its length: clocking at 54 minutes, it could do with a track or two less. The previously mentioned two songs come to mind, but the main reason to its lengthiness is actually the title track that is eleven and a half minutes long. "The Rapture" consists of three different parts that segue into one another, and is an artistically ambitious composition driven by McCarrick's cello arrangements. It is an exquisite piece per se and got the attention it deserved when it was used as an opening song for the second set of Siouxsie's Dreamshow live recording, backed by the Millennia Ensemble orchestra. It just doesn't fit in the middle of the album, surrounded by four-minute pop tunes. Either it should've been the album closer, or it could've been released as a stand-alone EP. Probably the latter, as the ferocious "Love Out Me" serves as a powerful ending note for the record. Lyrically it describes a self-destructive person's desperate plea for help: "Love me / Hate me / Help me / Save me from me / Hold me / Hurt me / Stop me / Take this love out me!". Interestingly enough, the occasional saxophone sounds on the last song of their last album recall the use of the instrument on their debut The Scream. It is sad that this is where the Banshees' story comes to an end but with "Love Out Me" they do bow out with a roar. The Rapture is an interesting record. Considering it was written of their own accord, this is exactly as they wanted the album to turn out like. It's possibly the happiest-sounding record the Banshees ever wrote and along with Superstition, one of their most accessible ones. It still provides the listener with a broad soundscape from its initial poppiness to the thunderous "Not Forgotten", the raging angst of "Love Out Me" and the subtle melancholy of "Sick Child". During the '90s, Siouxsie's voice started to change with her pitch lowering, likely due the natural effect aging has on vocals although being a lifetime smoker surely contributed as well. And nowhere on the album can this new, more robust voice be heard as well as on the dramatic, partly spoken word number "The Double Life". Personally I think that both Superstition and The Rapture are actually very nice pop albums that have received disproportionate criticism. 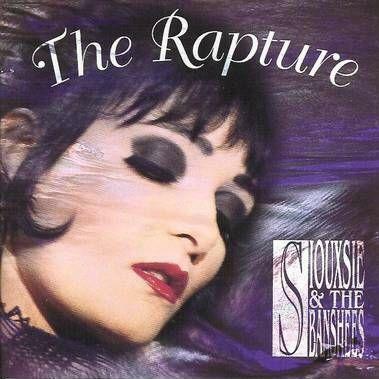 No, they don't sound like Juju or The Scream but that's exactly the thing: Siouxsie and the Banshees were a spectacular band in that sense that whenever they recorded a new album, they came up with a new sound - a sound that was distinctively Banshees-y but still something fresh that hadn't been heard from them before. How sad would it be if they still relied on same kind of pattern after 14 (as in Juju's case) or 17 (as with The Scream) years! The band evolved, but unfortunately not all of their fans did. In the end, The Rapture is a fine Banshees pop record and gives a worthy ending chapter to the story of one of the most important groups to emerge from the post-punk wave. Bravo. Try at least: "Stargazer", "Sick Child", "Forever", "Not Forgotten"
Absolutely dead on. I will add that The Rapture (title track) is like listening to a story. Every time I listen to that song I discover something new. It's an amazing gift from this band. Thank you so much for your review. Thank you very much for the feedback! Yes, the title track is definitely a grower that unfolds more and more with every listen. A criminally overlooked gem in their back catalogue.